Montpellier is the capital city situated in the Langeudoc-Rousillon area in the southwest of France. The city is located on a hill near the River Lez, about 10 km from the coastline of the Mediterranean Sea. The original name of the city was Monspessulanus, which stands for; either the Mont Pelé, meaning the naked hill, describing the poor vegetation of the area in its early years; or the le Mont de la Colline, which means the mount of the hill. There are two hills on which the city is built, the Montpellier and the Montpelliéret. The highest point of the city is the Place du Peyrou which stands at an altitude of 57 meters. The city of Montpellier gives a very intimate feel, having narrow and old streets, all varying in altitudes due to the inclined terrain. The climate in Montpellier is typical of the Mediterranean region with winters that are mild and damp and summers that are very warm and dry. The city comprises of seven neighborhoods which are further divided into sub-neighborhoods and all the neighborhoods have their own separate councils. This system was introduced in 2001 and has been effective ever since. Elegantly cultured and tolerant, Montpellier is often referred to as the most seductive city in southern France. Architectural masterpieces add a classically dynamic feel to the structures of the city. The most graceful central square, Comédie, is the perfect place to enjoy the warm sunshine during the day. It takes almost 50 minutes on a bike to ride to the sea from Montpellier. Montpellier is home to a globally popular summer festival, the Festival de Radio France et Montpellier. The festival comprises of jazz and classical music having over 150 events such as opera, concerts, talks and films. The city has two venues for concerts which are spacious enough to capacitate thousands of viewers. The two venues are Le Zenith Sud and L’Arena. Geographically, Montpellier is almost 170 kilometers away from the city of Marseille and nearly 242 kilometers from Toulouse. It is also at a distance of almost 748 kilometers from Paris. As the eighth largest city of France, consensus has showed that it is the fastest growing city within the country in the past quarter of a century. It ranks third amongst the largest French cities located on the coast of the Mediterranean. How to get to Montpellier? Montpellier Méditerranée Airport is located on the outskirts of Montpellier. A bus service called Navette takes you to the centre of the city. During busy periods, visitors may even have to wait for up to 30 minutes for a taxi, especially after the arrival of a flight from Paris. Visitors need to keep in mind that taxis on the airport can only accommodate four people therefore larger families and groups will need to pay for two taxis. As it is a small city, Montpellier can be toured by walk quite easily. It is rich in its attractions and provides a variety of museums and other sites for tourists. The Place de la Comédie is the central square of the city with its opera house, Opera Comédie, built in the late 1800s. The historical centre of the city contains a number of ancient architecture from the Medieval Era and Rue du Bras de Fer (Iron Arm Street) is also a representation of those times. Visitors having an interest in natural beauty should visit the Jardin des Plantes de Montpellier, which is France’s oldest botanical garden that has been established in the year 1593. There are a number of Hôtels in Montpellier, the architecture of which is a must-see. The art museum, Musée Fabre, also deserves a visit during a stay at this charming city and Antigone District boasts many architectural projects from the neo-classical era. Along with all these sites, there are also several old churches that can be visited within the town. On a day when the weather is fine, a walk along the streets will be welcome and if you love animals, visit the local zoo with its Amazon forest inside. The city has several shopping areas for all sorts of budgets. Centre-Ville is fantastic place for high class shoppers while the Polygone Shopping Center serves those with a more modest budget. A wide variety of other stores are also available such as, Inno and FNAC. For those wanting a unique experience, a huge flea market takes place every Sunday morning. The market is located at the last tram stop at Mosson and sells almost everything, all at a very cheap price. The real treasures of the city are the independent bookstores including Sauramps and the Gibert Joseph Bookstore. These stores offer books on an expansive array of topics and languages, which are truly something cherished by bookworms. The vicinities of Rue Saint-Guilhem, Rue de l'Ancien Courrier, Rue de la Friperie and Rue des Soeurs Noires host a variety of specialized shops including gaming areas, comic book stores, Japanese arcade areas and stores that contain Medieval goods and crafts. Montpellier is a cosmopolitan city that offers traditional French food. Tourists have a wide choice of food shops and stalls that offer sandwiches and kebabs. Even sitting at a French bistro becomes possible in Montpellier in the Place de la Comédie. You can even find Vietnamese food at Le To-ly. As a blend of locals and tourists live in the city, food is available at varying price ranges. France is known for its wine and a number of bards, clubs and pubs dot the city of Montpellier. There are even a few salsa clubs for the young and lively. A number of excursion and tours are provided in Montpellier and you can choose to ride in a minivan or arrange for your own personal tours to specific destinations. You can choose to take a tour ride over the river, discover the underwater caves of the area, paddle a canoe and much more. 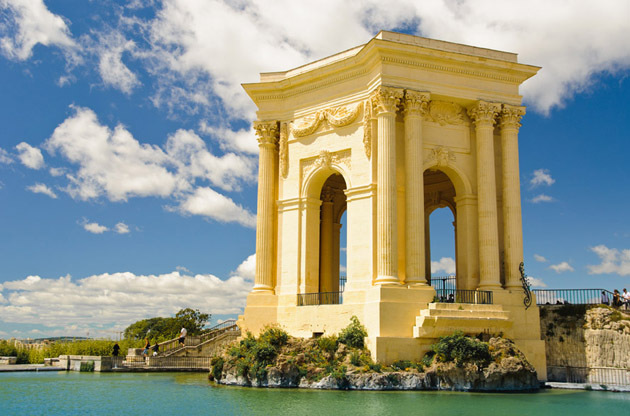 Thanks to its historical richness and perfect location, Montpellier has always been an attraction point in France. Each year, more than 500 business events like conferences, congresses, tradeshows, fairs, exhibitions and symposiums take place in this city and nearly 1.5 million delegates come to Montpellier from all around the world.